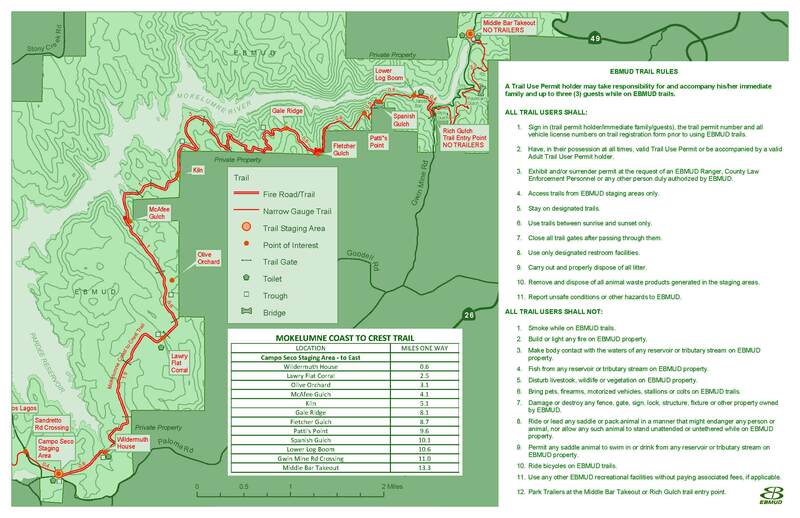 Trail is comprised primarily of all-weather gravel roads with mild to moderate slope. Note: Because of the intense boating & water activities at Camanche Reservoir from Memorial Day weekend through Labor Day weekend, Camanche campgrounds fill, but not Turkey Hill or Pardee Recreation Area Campgrounds. Pardee Recreation Area is closed November through January. The Wildermuth House is shown in this historic photo with three of the Wildermuth children, from the left, John Andrew, Ada and Isaac. All three were born in the stone home. The Wildermuth House is an excellent example of the stone masonry work of William A. Watt. The home was built for John H. Wildermuth in 1861. Hand-dressed sandstone blocks which were quarried from the hillside nearby were used in the construction. The Wildermuth House is situated near the old Campo Seco Road, which was heavily traveled between the mining centers of Campo Seco and Paloma, site of the famous Gwin Mine. Wildermuth House trail was designed, built, and signed by EBMUD.